During the unrivalled dominance of the New York Yacht Club, no vessel came closer to winning the America’s Cup from its owners than the Endeavour. She was one of the most stunning yachts of the J Class era: created by the master designer Charles Nicholson for the Royal Yacht Squadron, her speed became legendary, and she was tipped by many to prevail over the Rainbow of Harold Vanderbilt in the America’s Cup of 1934. Sure enough, she stormed to spectacular victories in the first two races of the series, breaking the course record in the second. She made a similarly impressive start in the third race, and seemed unstoppable; but the intervention of master helmsman Sherman Hoyt turned the course of the race, resulting in an American win by a margin of more than three minutes. It was the fourth race which was to prove the Endeavour’s undoing. Having again taken an important lead, she found herself overtaken in an illegal manoeuvre by the American boat. She duly raised a protest flag as she approached the lines; however, in contrast to British conventions, the NYYC rules stated that a protest flag must be displayed at the time of the incident concerned, and the race was awarded to the Rainbow. Their morale broken, the British crew crashed to defeat in the final two races: one of yachting’s greatest encounters had ended in another American victory. The America’s Cup dates from 1851, when the Marquess of Anglesey donated a cup for the Royal Yacht Squadron’s annual regatta. This event marked the beginning of the NYYC’s supremacy: as the schooner America won the 16-yacht event by a margin of 20 minutes, Queen Victoria asked who was second, to be met with the reply, “There is no second, your Majesty.” The Cup was donated to the NYYC by the America’s owners in 1857, and here it was to remain until the Australian victory in 1983: in all the winning streak stretched to 132 years, making it the longest, in any competition, in sporting history. This race, perhaps the most thrilling of that period, is here breathtakingly immortalised by one of the world’s finest marine painters. At the outbreak of the First World War he joined the Royal Navy and it was during his service as a naval officer that he met Charles Napier Hemy, who was to have a profound effect on the young man's art. During the war, Dawson continued his artistic work by supplying the Sphere publication with illustrations. These were normally in monochrome. 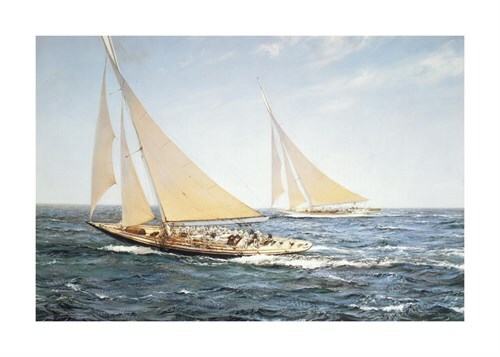 After the First World War he set up as a painter and illustrator, concentrating on historical subjects and portraits of deep water sailing ships, usually in a stiff breeze and a high sea. It was in the 1920s that he became contracted to Frost and Reed. With them he became "king of the clipper-ship school". From the early 1930s he lived at Milford-on-Sea in Hampshire and he exhibited occasionally at the Royal Academy between 1916 and 1936. In the Second World War he again worked for the Sphere, supplying them with pictures of events of the war. He exhibited regularly at the Society of Marine Artists' exhibitions between 1946 and 1964 and was an elected member. He was also a Fellow of the Royal Society of Arts. Montague Dawson died in Sussex, Southern England on 21st May, 1973.